Flowing, expansive, heartwarming yoga practices and kirtan (mantra meditation) suitable for everyone. Please bring a mat, and covering for relaxation. Donations are welcome. 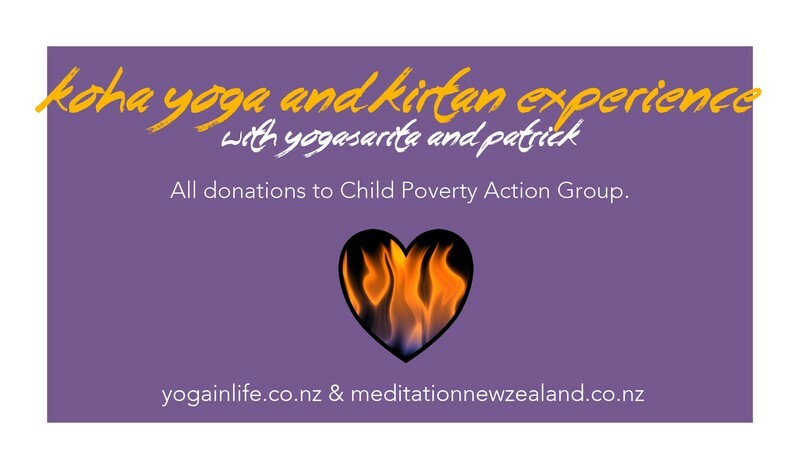 All proceeds go to Child Poverty Action Group, whose kaupapa aligns with the Children's Fire. A tiny fire that the ancient Native American elders brought into their circle of law to remind them of their pledge that no decision, action or entity they make will harm their children or Nature's children for 7 generations. Imagine if we placed the Children's Fire at the centre of all our institutions of power! Yogasarita is an experienced and caring yoga teacher who works specifically with the unique needs of her students. She has trained in Australia, NZ and India and holds a Diploma in Yoga and a Master in Counselling. Patrick is a gifted kirtanist (singer and musician of devotional songs) with a strong and soulful voice.